The question stayed with me as our pilot announced our initial descent into Tel Aviv, and like the students and chaperones, I found myself eagerly looking out the window at the city coming into view below. How many times do we have to travel someplace before it feels familiar? How many times before it feels “like home”? How many times must we go someplace before we feel we’ve seen and done it all – that we’re maybe, a little bored of going there? 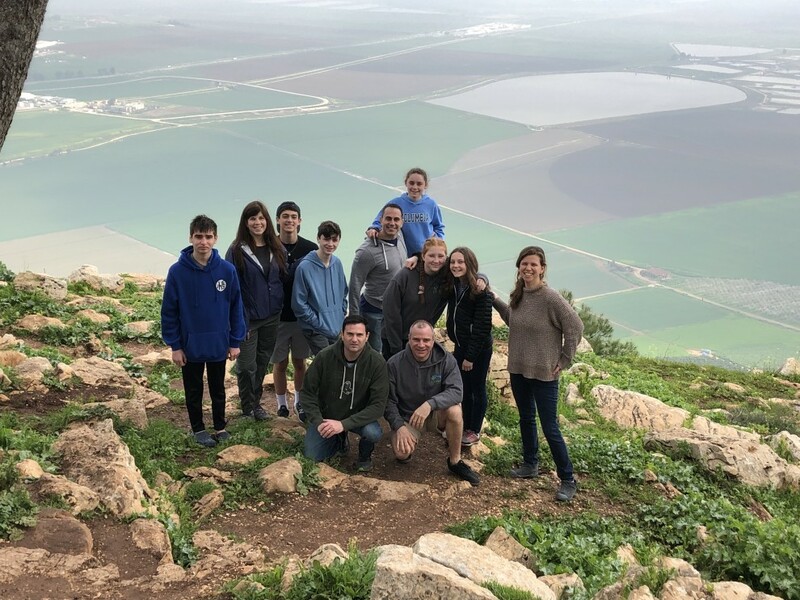 This past February, I had the distinct honor and privilege to travel to Israel with Hevreh’s Pre-Confirmation Class, which included six students and four parents. As this trip has evolved into its second year, it has truly become a family experience: the opportunity for a group of parents and young teens to discover, together and apart, all of the beauties and complexities of the modern State of Israel. The eight days we spend together traveling around Israel are, of course, amazing: the sights, sounds, smells and of tastes of Israel weave a sort of magic around the group. Both students and parents came with a hunger and curiosity to explore and encounter, and with that openness, the trip unfolded beautifully. What we have created isn’t rocket science: there are literally hundreds of ways to travel to Israel for our young people, among them semester in Israel study programs, summer teen tours. Soon enough, they’ll be eligible for Birthright Israel trips. So, what makes this trip so uniquely impactful? The answer is relationships. This trip is grounded in a relationship that has been cultivated and funded by the Jewish Federation of the Berkshires. The experience of spending time in the Berkshires’ Partnership2gether community of Afula-Gilboa anchors the experience in a way that elevates the trip from tour to encounter. I want to share a vignette of the trip that really brings to life the vibrant connection that has been forged between our Berkshires community and the wonderful people in Afula-Gilboa. Karen Brustein was born in Brazil and made Aliyah to Israel when she was young, settling with her family at Kibbutz Jezreel. Karen and I met last year when, in her capacity as a program coordinator for the Partnership and as a resident of the kibbutz where we were staying, she took us on a walking tour of the kibbutz. This past year, Karen and I worked closely in the six months leading up to our visit to plan an intentional encounter between their B’nai Mitzvah group and our visiting students. The evening we spent together was wonderful: the students introduced themselves and with the help of me and their madrikhim, we were able to bridge the language gaps. They sat together in small groups and talked about everything from what subjects they study in school, to what they hope to be when they grow up, to which they prefer: shwarma or falafel. They made dinner together, preparing pizzas in a traditional taboon oven outside on a crisp February night. At some point, Karen and I found ourselves standing on the side of the room, watching as parents from the kibbutz and the Hevreh parent chaperones sat and laughed, and the teens ran around on the mirpesset outside the community room. It was truly a warm and meaningful encounter: but the real moment of connection came as the table was being cleared and the official program was wrapping up. This phrase, “the best night ever” would become a refrain throughout the week, due in large part to the hospitality and openness of our Partnership coordinators, Achiya Ben-Ari and Naveh Yogev, and our Kibbutz Jezreel hosts, Rahel Piekarski and Karen Brustein. They put their hearts into planning a visit for us that allowed our group to get beneath the surface of a tour. The night after the first “best night ever,” our group was hosted by Itzik, who runs Moadon Sandwich, or the “Sandwich Club," which this year received a $3,000 grant from our Federation. Five nights a week, Itzik welcomes 50 teens to the Afula community center. Itzik is of Moroccan descent, with gray-blue eyes that sparkle when he laughs. Itzik himself is a recovering addict and dedicates his life to serving those who might otherwise be on the margins. He works with prisoners, as well as with this population of teens with varying levels of challenges in their home lives. They play X-Box and foosball, work on homework – and then make a big dinner for themselves before they get to work. This gathering is called the Sandwich Club because each night, they make over 200 bagged lunches for children in Afula who need supplemental food. Truly, the best night ever. Reflecting back on the words of Pico Ayer, this was truly a trip that helped each of us to open our hearts and our eyes, and to find ourselves anew. Rabbi Jodie Gordon is a rabbi and educational director at Hevreh of Southern Berkshire in Great Barrington.